Drax is the least interesting of the Guardians, so the movie was smart to invent a personality quirk for him. 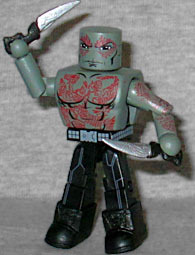 The figure is the appropriate green-grey color (designed to keep audiences from confusing him with Hulk), and has a massive powerhouse chest that's painted with all his red tattoo things. He has bulky boots, so his lower body doesn't look spindly compared to the chest, but no arm or thigh add-ons, so he isn't as big as Hulk, either. He's armed with his two daggers, which are new molds. A sentient, ambulatory tree-person with a limited vocabulary, Groot is the personal muscle of Rocket Raccoon, an experienced thief and prison escapee. 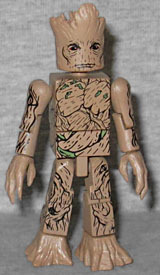 The final production version of Groot looks a lot better than the prototype. He has new hands, feet and head, plus a waist cap designed to make him taller. On the prototype, that waist had a sculpted texture, but no paint; the final is smooth, but has paint that matches the chest and legs - much better choice! The paint on his face has even been toned down from the proto, keeping him from looking too old. A few lines of black on his hands and feet would help them blend in, but probably would have been too expensive to get right. The set comes with Rocket, who's really a glorified accessory (like the various animals included in the Thundercats sets). He's a single, unarticulated piece, standing only half as high as the average Minimate. He's wearing his orange jumpsuit and is holding a (comparatively) large black gun. There are two tabs on the back of Groot's head that are supposed to fit between Rocket's legs so he can ride up there, but either the pegs are too thin or the legs are too wide, because all he does is fall off. You can squeeze his tiny little hand onto one of the tabs if you try, though.